With a running time of 87 minutes, this disc is a must have for fans of the big man as he’s chosen the episodes and skits that you are going to watch. 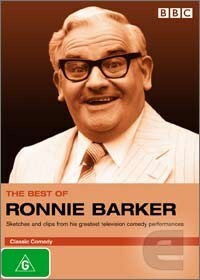 That’s right, Ronnie Barker has picked the content of this DVD which I found to be an absolute treat. Barker has a certain style of humour that might not appeal to everyone but it’s an eager type of humour that always is going to give you a chortle, either through it’s ridiculousness or the fact that Barker is such a showman that you feel like you are sharing a secret with him. Included are bits from Two Ronnies, Clarence and Magnificent Evans, Porridge and Open all hours, some of the finest British comedy to come out from old blimey in quite some time. Younger viewers might not think this disc looks particularly “cool” however you are doing yourself a disservice if you miss out on this great DVD.